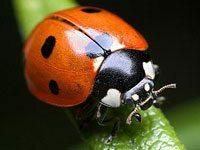 Ladybugs are also called lady beetles or, in Europe, ladybird beetles. There are about 5,000 different species of these insects, and not all of them have the same appetites. What does a Ladybugs look like? 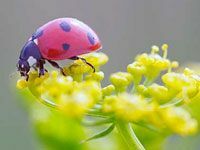 Many people are fond of ladybugs because of their colorful, spotted appearance. Ladybugs appear as half-spheres, tiny, spotted, round or oval-shaped domes. They have short legs and antennae. 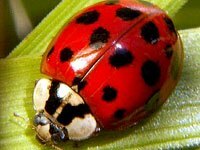 Ladybugs are found worldwide, in almost any type of climate, and in wetlands. However, they won’t fly if the temperature is below 55 degrees fahrenheit. There are over 5,000 species described, with more than 450 species that are native to North America alone. They are small insects, ranging from 1 mm to 10 mm (0.04 to 0.4 inches), and are usually yellow, orange, or scarlet with small black spots on their wings, with six black legs, their head and antennae are also usually black. What does a Ladybugs eat? Farmers love Ladybugs for their appetite. 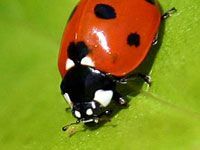 Most ladybugs voraciously consume plant-eating insects, such as aphids, and in doing so they help to protect crops. 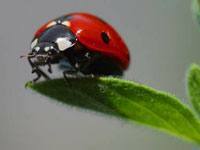 Ladybugs lay hundreds of eggs in the colonies of aphids and other plant-eating pests. When they hatch, the ladybug larvae immediately begin to feed. 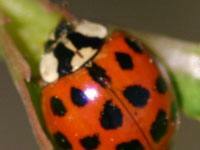 By the end of its three-to-six-week life, a ladybug may eat some 5,000 aphids. Download free Ladybug wallpapers, click on the image to open the large version. Print free Ladybug coloring pages, click on the image to open the large version.